Back to the recipe, as I was searching other people’s tilapia recipes, I kept running across the same ‘ol same ‘ol. It was a lot of flavors and methods I’d pretty much done before. Then I saw this recipe. I recognized this blog as one I’d landed on before. As I began to look at the ingredients, I got excited to realize I had EVERY SINGLE ONE OF THEM on hand, and I even had the onion & pepper already chopped up! I must admit though, I was a little wary of the mayonnaise. Once before I had made a fish recipe that required mayo, with not so good results. But I went ahead and made this according to the recipe, and let me assure you, once cooked YOU CAN’T TASTE THE MAYO AT ALL. In fact, once we ate, I completely forgot it was there. 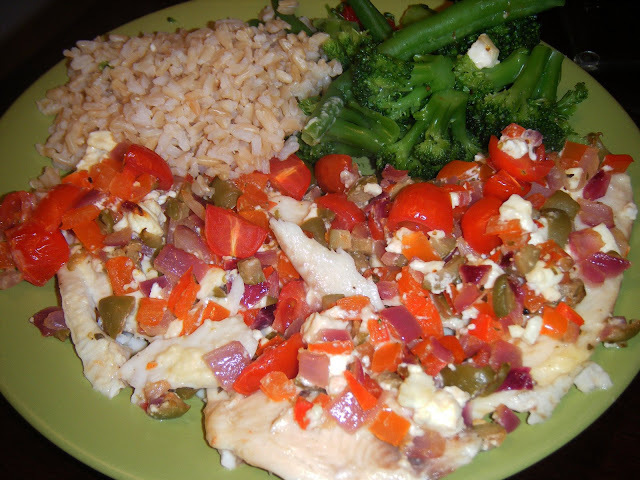 This was a great combo of flavors, especially if you’re looking for something different to do with tilapia. I threw in some grape tomatoes as well, because I thought they would add some sweetness and juice to the meal, and I’m really glad I did. As usual, we ate ours with our standard brown rice & steamed veggies. Yummy! This is something I’ll definitely be making again. Heat olive oil in nonstick frying pan and saute red pepper and onion about 3 minutes. Add olives and tomatoes, saute about 2 minutes more. Turn off heat. So glad you liked it. I agree, the tomatoes sound like a nice variation. Yum – looks so flavorful and healthy! What beautiful colours and such a lovely recipe! That baked tilapia looks really good!